************************************** Knights of the Old Republic - The Sith Lords ************************************** TITLE: Effixian's Mandalorian Disguises for TSL AUTHOR: Effix CONTACT: PM me on the forums or find me on Steam ************* INSTALLATION ************* Unzip, copy the files from the folder to your override folder. 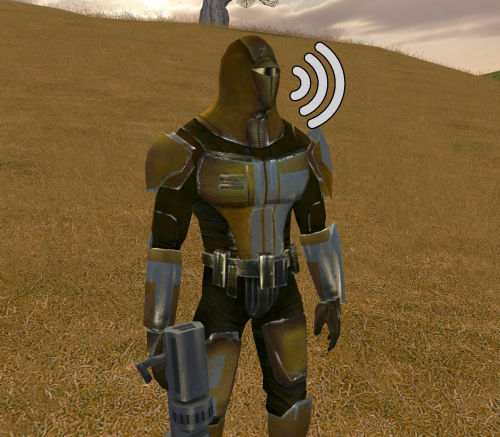 ************ DESCRIPTION ************ This mod adds a disguise property to the heavy Mandalorian armors that makes you look like the Mandalorian NPCs when you equip them. Blue: Mandalorian Battle Armor Red: Mandalorian Heavy Armor Yellow: Mandalorian Assault Armor Relevant icons are updated to match the new appearance. Requested by JDub96. 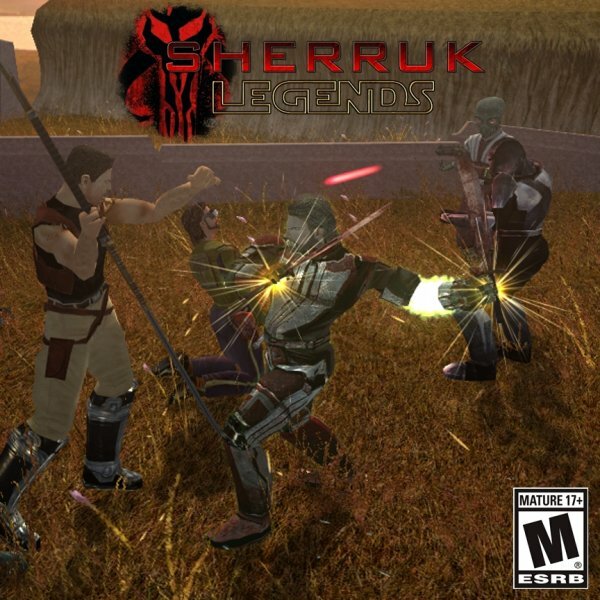 This mod is also available for KotOR 1. ***** BUGS ***** This goes for any item with the disguise property: your appearance can get stuck because of unknown reasons, meaning you'll keep the appearance even when you unequip the item. This can be fixed with the KotOR Savegame Editor. ************* UNINSTALLING ************* Remove the following files from your Override folder: a_heavy_07.uti a_heavy_08.uti a_heavy_10.uti ia_Class9_004.tga ia_Class9_007.tga ******************* DISTRIBUTION NOTES ******************* You may use the material from this mod in whichever way you like. ******** Thanks to ******** Stoffe and Fred Tetra for the needed tools and tutorials JDub96 for the request ------------------- THIS MODIFICATION IS NOT MADE, DISTRIBUTED, OR SUPPORTED BY BIOWARE, OBSIDIAN, OR LUCASARTS ENTERTAINMENT COMPANY LLC. ELEMENTS TM & © LUCASARTS ENTERTAINMENT COMPANY LLC AND/OR ITS LICENSORS. *************************** Knights of the Old Republic *************************** TITLE: Effixian's Mandalorian Disguises for K1 AUTHOR: Effix CONTACT: PM me on the forums or find me on Steam ************* INSTALLATION ************* Unzip, copy the files in the folder to your override folder. 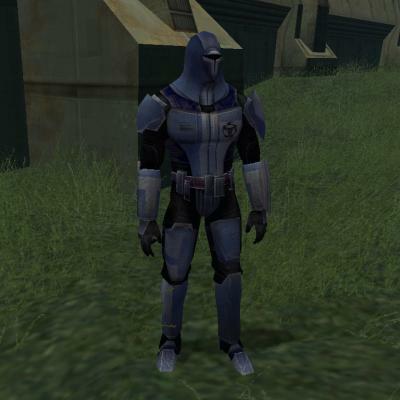 ************ DESCRIPTION ************ This mod adds a disguise property to the heavy Mandalorian armors that makes you look like the Mandalorian NPCs when you equip them. Blue: Mandalorian Armor (only obtainable with cheats), Mandalorian Battle Armor Red: Mandalorian Heavy Armor Yellow: Mandalorian Assault Armor, Cassus Fett's Armor Relevant icons are updated to match the new appearances. Requested by JDub96. 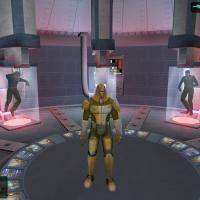 This mod is also available for KotOR 2. ***** BUGS ***** This goes for any item with the disguise property: your appearance can get stuck (because of unknown reasons), meaning you'll keep the appearance even when you unequip the item. This can be fixed with the KotOR Savegame Editor. 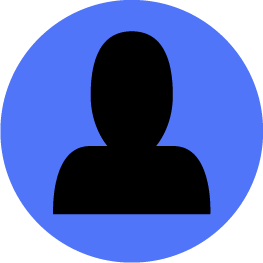 ************* UNINSTALLING ************* Remove the following files from your Override folder: g_a_class8004.uti g_a_class9003.uti g_a_class9004.uti g_a_class9009.uti g_a_class9010.uti ia_class8_004.tga ia_class9_004.tga ia_class9_006.tga ia_class9_008.tga ******************* DISTRIBUTION NOTES ******************* You may use the material from this mod in whichever way you like. ******** Thanks to ******** Stoffe and Fred Tetra for the needed tools and tutorials JDub96 for the request ------------------- THIS MODIFICATION IS NOT MADE, DISTRIBUTED, OR SUPPORTED BY BIOWARE, OBSIDIAN, OR LUCASARTS ENTERTAINMENT COMPANY LLC. ELEMENTS TM & © LUCASARTS ENTERTAINMENT COMPANY LLC AND/OR ITS LICENSORS. 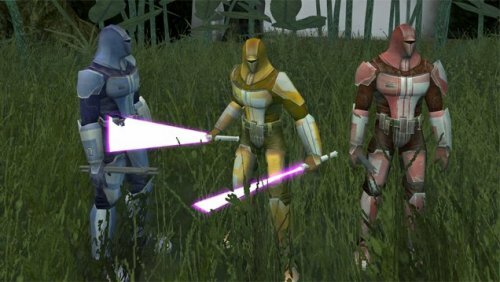 ~~~~~~~~~~~~~~~~~~~~~~~~~~~~~~~~~~~~~~~~~~ Traditional Mandalorian Blades ~~~~~~~~~~~~~~~~~~~~~~~~~~~~~~~~~~~~~~~~~~ for Knights of the Old Republic This modification adds traditional Mandalorian beskar iron melee weapons, the Beskad and the Kal. The weapons can be found and purchased in-game. If you prefer different bonuses for the weapons, you can use your favorite GFF editor to modify the UTI files that the installer places in your Override folder. I made the models and textures. The textures are 1K and relatively simplistic. 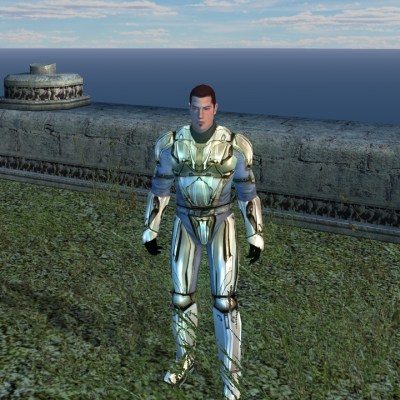 The original uncompressed textures, along with UV and AO map overlays, can be found in the Modder's Resource package (it is the same as K2:TSL version's Modder's Resource package). Thanks to JDub96 for requesting this, and also to Kexikus for his folder priorities tutorial that helped me realize that .mod takes precedence over .rim ... which was making me go a little insane . Re-distribute or re-use this mod as you like, in full or in part. 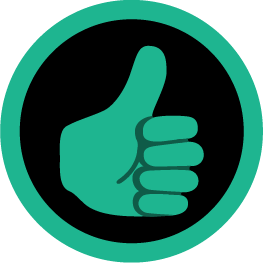 ~~~~~~~~~~~~~~~~~~~~~~~~~~~~~~~~~~~~~~~~~~ COMPATIBILITY ~~~~~~~~~~~~~~~~~~~~~~~~~~~~~~~~~~~~~~~~~~ The modification is designed for use with K1R. Whether it works without it is unknown. The modification uses model variation 41 of vibroblade and vibrosword. 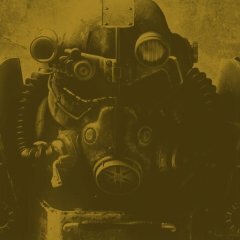 It will not work with other mods that provide w_vbroshort_041 or w_vbroswrd_041. 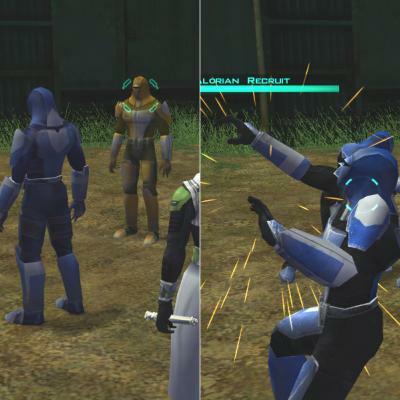 The modification MAY be incompatible with other mods that affect Igear in Taris undercity (module tar_m04aa), the Mandalorian encounter on Dantooine (module danm14ac), or the Mandalorian commander on Kashyyyk. ~~~~~~~~~~~~~~~~~~~~~~~~~~~~~~~~~~~~~~~~~~ SPOILERS ~~~~~~~~~~~~~~~~~~~~~~~~~~~~~~~~~~~~~~~~~~ You can find the objects in-game at... THIS MODIFICATION IS PROVIDED AS-IS AND IS NOT SUPPORTED BY BIOWARE/OBSIDIAN ENTERTAINMENT OR LUCASARTS OR ANY LICENSERS/SPONSORS OF THE MENTIONED COMPANIES. USE OF THIS FILE IS AT YOUR OWN RISK AND THE ABOVE MENTIONED COMPANIES OR THE AUTHOR IS NOT RESPONSIBLE FOR ANY DAMAGE CAUSED TO YOUR COMPUTER FOR THE USAGE OF THESE FILES. 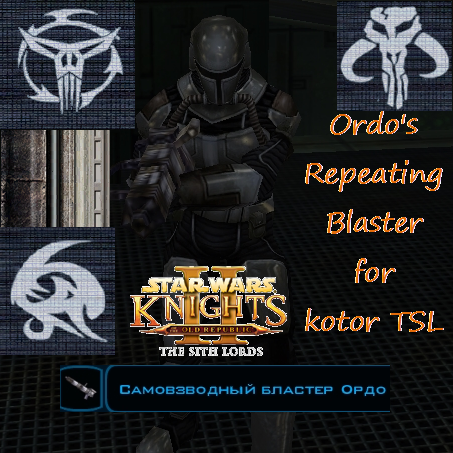 ~~~~~~~~~~~~~~~~~~~~~~~~~~~~~~~~~~~~~~~~~~ Traditional Mandalorian Blades ~~~~~~~~~~~~~~~~~~~~~~~~~~~~~~~~~~~~~~~~~~ for KotOR 2: The Sith Lords This modification adds traditional Mandalorian beskar iron melee weapons, the Beskad and the Kal. The weapons can be found and purchased in-game. The weapons have upgradeable Grip and Edge (because I couldn't figure out how to get just Grip upgradeable, which is what would have made sense to me), but they don't mention upgradeability in the description. If you prefer different bonuses for the weapons, you can use your favorite GFF editor to modify the UTI files that the installer places in your Override folder. I made the models and textures. 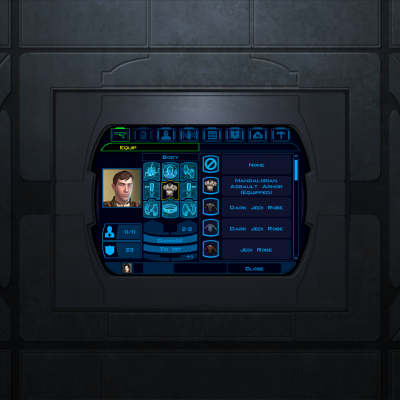 The textures are 1K in size and relatively simplistic in version 1. The original uncompressed textures, along with UV and AO map overlays, can be found in the Modder's Resource package (it is the same as K1 Modder's Resource package). Thanks to JDub96 for requesting this. Re-distribute or re-use this mod as you like, in full or in part. 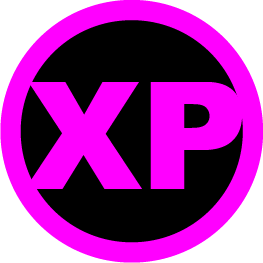 ~~~~~~~~~~~~~~~~~~~~~~~~~~~~~~~~~~~~~~~~~~ COMPATIBILITY ~~~~~~~~~~~~~~~~~~~~~~~~~~~~~~~~~~~~~~~~~~ The modification is designed for use with TSLRCM. Whether it works without it is unknown. 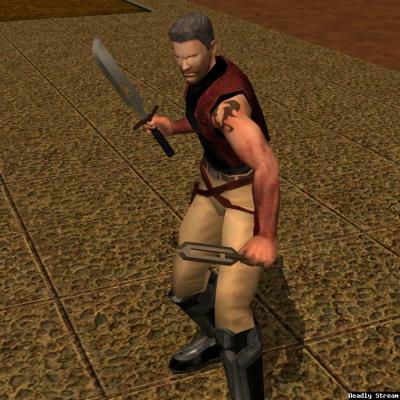 The modification uses model variation 41 of vibroblade and vibrosword. It will not work with other mods that provide w_vbroshort_041 or w_vbroswrd_041. 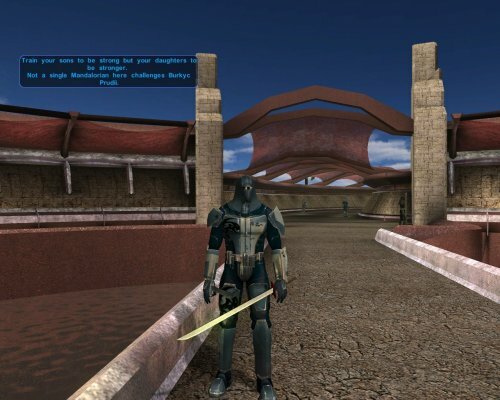 The modification MAY be incompatible with other mods that affect Kex on Dxun (module 403DXN) or the Mandalorian mercenaries on Dantooine (module 605DAN). ~~~~~~~~~~~~~~~~~~~~~~~~~~~~~~~~~~~~~~~~~~ SPOILERS ~~~~~~~~~~~~~~~~~~~~~~~~~~~~~~~~~~~~~~~~~~ You can find the objects in-game at... THIS MODIFICATION IS PROVIDED AS-IS AND IS NOT SUPPORTED BY BIOWARE/OBSIDIAN ENTERTAINMENT OR LUCASARTS OR ANY LICENSERS/SPONSORS OF THE MENTIONED COMPANIES. USE OF THIS FILE IS AT YOUR OWN RISK AND THE ABOVE MENTIONED COMPANIES OR THE AUTHOR IS NOT RESPONSIBLE FOR ANY DAMAGE CAUSED TO YOUR COMPUTER FOR THE USAGE OF THESE FILES. ******************************************** Knights of the Old Republic - The Sith Lords ******************************************** TITLE: Effixian's Mandalorians Tweak AUTHOR: Effix(ian) CONTACT: PM me on the forums or find me on Steam ************* INSTALLATION ************* Put the contents of the zip file into your Override folder. 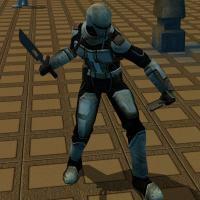 ************ DESCRIPTION ************ A subtle mod that slightly changes the Mandalorians skins. It darkens & removes the color from the cloth parts, makes the white parts in the armor a bit brighter and the colored armor parts a bit more colorful / less washed-out. ************** COMPATIBILITY ************** This is purely a reskin mod that should not conflict with any mod. ***** BUGS ***** None ************* UNINSTALLING ************* Remove from the Override folder: N_Mandalorian01.tga N_Mandalorian02.tga N_Mandalorian03.tga ********* THANKS TO ********* Fred Tetra for KotOR Tool ------------------- THIS MODIFICATION IS NOT MADE, DISTRIBUTED, OR SUPPORTED BY BIOWARE, OBSIDIAN, OR LUCASARTS ENTERTAINMENT COMPANY LLC. ELEMENTS TM & © LUCASARTS ENTERTAINMENT COMPANY LLC AND/OR ITS LICENSORS. 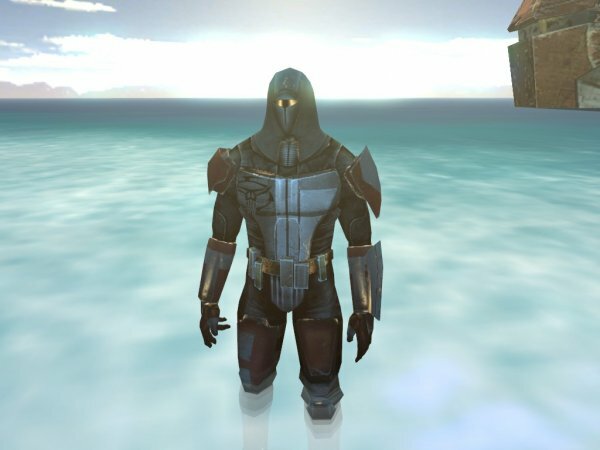 I reskinned the Mandalorians, resized the textures to 1024x1024 and gave them the white marking on the helmet like in TOR. This is part of a larger project. Blades such as this one are the weapon of choice for Mandalorians. A warrior used to make his first battle blade after his first victory. Each one is unique in its construction, and it is very rare to find one that is not with it's owner - most great Mandalorians are buried with their blade. 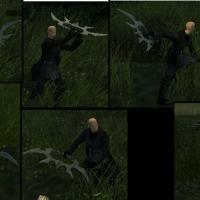 This mod adds two new weapons to the game, based on the bat'leths wielded by Klingons in Star Trek: The Next Generation etc. The are called Mandalorian Battle Blades. 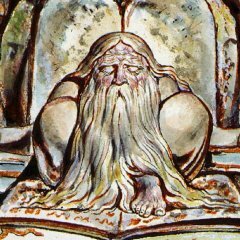 One can be found in one of the hidden caches on Telos, and has +2 Attack Bonus and +2 Slashing damage. The other is Mandalore's Battle Blade, which can be found in Mandalore's room on Dxun. This second weapon has +2 AB, +2 slashing damage, and the Keen item property. Its model is based on the Sword of Kah'less.